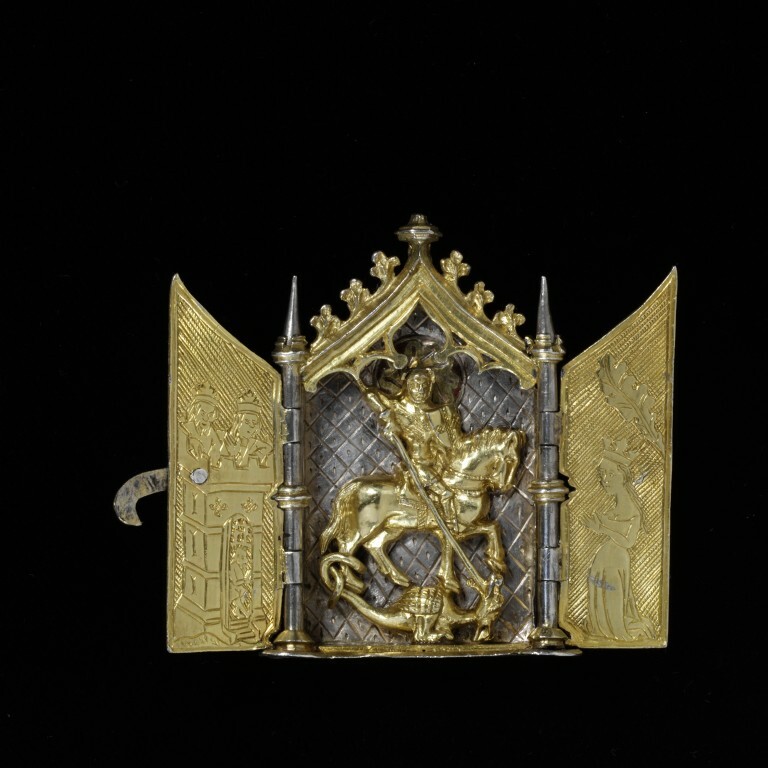 Triptych altarpiece, with integral hinges, engraved and partially gilded silver, enamelled, of rectangular form with pointed arch at top, with a suspension ring, closed by a hasp attached to the left wing. The central plaque shaped as a crocketed canopied tabernacle, with a scene of St George and the Dragon, the background engraved with a diaper pattern, the figures applied in relief, the saint's halo decorated with a wheel-shaped foliate motif, the shield and armour engraved with the cross of St George. The interior of the left wing with a hatched ground and engraved with a king and queen seated on top of a castellated tower, in the doorway a porter beneath a portcullis. The interior of the right wing with a simply hatched ground and engraved with a kneeling princess with a leaf above. The exterior of both wings engraved with architectural motifs of columns and tracery windows on a hatched ground, the exterior of the central plaque engraved with a masonry motif. Silver gilt triptych altarpiece depicting St. George and the Dragon. England or Germany, about 1400. Lightbown, Ronald. Medieval European Jewellery: with a catalogue of the collection in the Victoria & Albert Museum. London: Victoria & Albert Museum, 1992. cat. 89. p. 533.